Click below to continue going to Guy Deal’s support page on Facebook. Guy felt God calling him into the ministry at a young age. While he was at church camp in eighth grade, Guy felt the call of God on his life. He followed his father’s example in construction and later graduated from Iowa State University with a degree in Construction Engineering. After graduating from college, Guy was involved in both bridge construction and general building construction. He took a job in Saudi Arabia with Fluor Engineering, where Guy worked with various internationals. He enjoyed getting to know more about the people and learning about their culture. After completing his work in Saudi Arabia, Guy traveled to the Philippines, where he met a missionary family. As Guy ministered with them over the next four months in the mountainous provinces of the Philippines, he felt the Holy Spirit touch his life. He knew God was calling him to full-time ministry and he knew that what he had been searching for was revealed. Guy submitted to God’s call and entered Asia Pacific Theological Seminary in the Philippines where God used Guy’s talents in engineering and construction to help the college design and build their new campus. He spent the next two years as a missionary associate before receiving his appointment as a World Missionary with the Assemblies of God. Guy and Kathy met while he was itinerating to raise funds to go back to the Philippines. Kathy (Wootton) is a graduate of Central Bible Collage and has worked on staff for the Ohio Ministry Network, The Complete Biblical Library, and Des Moines First Assembly of God. For over ten years, Guy ministered in the Philippines and Indonesia both in church planting and in using his background as an engineer to help design and build Bible schools. 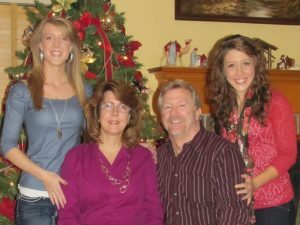 When Guy and Kathy, and their two daughters returned home, Guy joined the staff of Teen Challenge (TC) in Iowa. Soon afterward, he was invited to be part of the TC ministry in Columbus, Ohio, where he served for the next seven years as the Executive Director. Having a passion to minister to the various ethnic groups in America, Guy and Kathy received their appointment with Intercultural Ministries under US Missions to minister to internationals in America in 2004. Through Gershom Ministries, Guy and Kathy are reaching out to the internationals living and working in Columbus, Ohio, and are partnering with IFI to establish friendships among the international students on The Ohio State University campus. By experiencing the love of the Lord, many have come to understand that there is a God and have received Christ as their personal Savior. Guy and Kathy are still in the process of funding their ministry and would sincerely appreciate your prayers and financial support.